If we see any of these signs, we will do a thorough inspection and offer you the best foundation repair solutions for your foundation repair needs. Atlas Master Companies can repair your bowing or leaning walls with ECP helical tieback anchors and wall plate anchors. Helical tiebacks are installed from inside the basement wall through a small hole that is drilled. With exterior excavation, the basement wall is immediately pulled back to its original level. These helical tiebacks will also strengthen the wall. This will keep the wall from not bowing or leaning in the future. 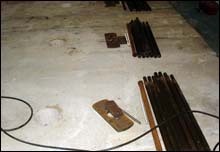 Wall plate anchors provide supplemental lateral force to stabilize bowing basement walls. There is minimal disturbance to landscaping and can be installed quickly. The ECP plate anchors consist of an inside wall plate, an outside anchor, and a high strength rod tying them together. Atlas Master Companies can also repair your bowing basement walls using the latest carbon-fiber technology developed by Fortress Stabilization Systems. Using carbon-fiber Kevlar sheet straps in combination with specifically designed epoxies, bowed basement walls can now be repaired with little to no obtrusiveness. The bowed basement wall can then be painted creating an invisible repair. If you notice bowing or leaning walls in your home or business in Virginia, let Atlas Master Companies come and thoroughly inspect your structure and offer you the best solution for your repair needs. The sooner the repair is done, the least amount of structural damage will occur throughout your structure. Don't hesitate, contact Atlas Master Companies today!